But for those new to Toronto or recently moved here, the excitement of our university and this whole city can easily translate into quite an alienating experience. Displaced from your home, friends, and family? Not exactly your standard definition of a comfort zone. Luckily for students living in Ryerson residences—Pittman Hall, the International Living & Learning Centre (ILLC), or O’Keefe House—there are many enthusiastic friends on your floor, whose arms are always open, they’re probably better neighbours than you ever had back home. Short of wearing a ‘Welcome’ mat around themselves, they are to your go-to for anything. Patricia Skagen-Emokpae, returning for her third year as Residence Advisor is one of these many wonderful people. Tell me a bit about yourself. Who is Patricia Skagen-Emokpae? I started my university career as an engineering student at the University of Alberta, I lived in rez at U of A even though I lived in Edmonton. Just because I wanted to try something new, and I was pretty shy so I wanted to step out of my comfort zone and meet new people. It was definitely the best decision I ever made. It really brought me out of my shell and I met so many people that I am still friends with today and will be my whole life, also just made a lot of really, really good memories. 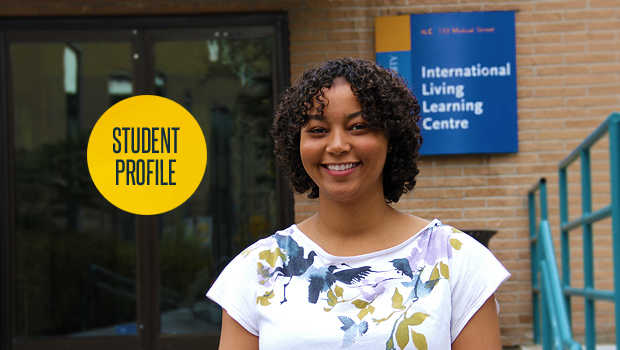 How have you been involved in residence here at Ryerson? I was a floor president in my first year. I definitely signed up for residence because of my experience at U of A. I just knew I wanted to do it again while being in a leadership position at Ryerson. Floor president is a member of residence council at Ryerson residences. It’s sort of like what the RSU is for the university. I was my floor representative on the council, I tried a bit of community building, helped people make friends. I’d organise events to help them get to know each other, get the floor to bond. I also helped with residence-wide events. Since my second year, I’ve been Residence Advisor. This year, I’m also a Community Leader. What are your responsibilities with that job? As a CL, I oversee a team of seven other student leaders who live on the upper floors of ILLC (floors 7-11), where I live. I help out the staff members who are new this year or have less experience. As an RA, you’re living on the floor with residence students. You’re there to be a role model and provide them with support throughout the year, any guidance they might need. You want to create a positive environment, so creating events, it’s especially important during the beginning of the year to facilitate that because everyone is terrified on move-in day. My job is to make sure everyone is okay from that Monday onwards throughout the year. What is it about residence that just makes you keep coming back? I think rez is just one of the best communities to be a part of at Ryerson… It’s probably THE best because you live with these people, right? You get to know them really well. There’s always someone around, someone to talk to, or someone to go to the gym or eat dinner with, or go to a movie with. You live with people who are all going to school, it’s right here, everything is so convenient. And it’s so easy to get to class. I just think as a rez student, it’s just natural to be connected to campus and a part of Ryerson. Haha, I don’t think your university experience is complete if you don’t live in rez for at least one year, it’s just something you have to do! Sounds like a lot of fun! What about for school? Does rez offer any help with that? Yes! We have Academic Links (ALs). ALs are kind of like a residence advisor, but instead of overseeing the floor, they oversee the students in a certain program in residence. So like the journalism students will have an academic link who’s in journalism, who can help them with their academics so they’ll facilitate study groups, hold office hours, they help you out with your academics. Yeah it’s not all community building fun times, because ultimately we’re all here for school, right? We try to make it about learning as well. How do you offer help on a personal level? We kind of act as resources, so if they’re having trouble emotionally or mentally, we can refer them to counselling. We’re not experts, so we can’t always solve problems. But we’re here as compassionate listeners and to help guide them to people who can help them. Did you have training for this? Yes, every summer. We came here two weeks before all the residence students came here. We spent a lot of time preparing for their arrival! We’re like the front line for crisis management in emergency situations. Like if a medical situation happens, we’ve all had CPR training, but we’d have to call security. We deal with all kinds of things in residence, alcohol poisoning, accidents and injuries. With really serious situations, like if a student is feeling depressed or suicidal, we really have to always be there for them. How do you approach students who don’t want to socialize? We just keep knocking on their doors, make sure that they feel that they’re valued as a member of the floor! But I definitely understand for some, it is a place to live, not everyone’s always interested in being oriented…but I still don’t really just let them be! We normally get pretty good participation with events, because they do live with us, and they’re interested in making friends with the people they live with. They can’t escape, hahaha. I just want to make sure that they know that I’m there for them. And they’re welcomed on the floor. I want everyone on my floor to feel like they can sit in the lounge and have a conversation with anyone and feel comfortable. It sounds like a really different community in rez than, say, in classes at Ryerson. Yeah! Well, because it’s where you live, right? It’s not professional or anything. Like, on move-in day for example, there’s so many different emotions, some people are really excited, but there’s also someone who’s just sobbing in their room. I tell them, it’s going to be okay. Just give it a day, I’ll help you out. You’re going to make friends, and you’re going to have a good time, don’t feel like you should quit. Just hang in there. What will you miss when you graduate this June? Oh! I’ll miss everything! Just sitting in the lounge and somebody else will come by and hang out, and before you know it, ten of us are chilling in the lounge. It will be weird to not have that anymore. When you live in rez, you have such a huge network of people that you know. I have to factor in time when I go somewhere to run into a couple groups of people to stop and chat for a bit. I’ll miss that. We really become like a family by the end of the year. It’s been said that students are the most likely to drop out of college or university within their first six weeks. It’s a short amount of time, but a lot can happen that can make or break how a student feels about their school. Orientation week is but a distant memory amidst the mountain of stressful deadlines, midterms, and projects due. For students new to Toronto or just living away from their home, friends, and family—this can be an even more vulnerable time. But in Ryerson residences, they’ll always have Patricia and many other floor presidents to turn to, consider her your year-long frosh leader. Patricia’s door is always open, you can find her and her frizzled hair on “the Magic School Bus” (also known as 9th floor ILLC)!